The No. 2 Fords of Brad Keselowski and the No. 22 of Joey Logano weren’t flashy, and they didn’t have the speed to challenge frontrunners Martin Truex Jr. and Jimmie Johnson in Sunday’s Citizen Soldier 400 at Dover International Speedway. 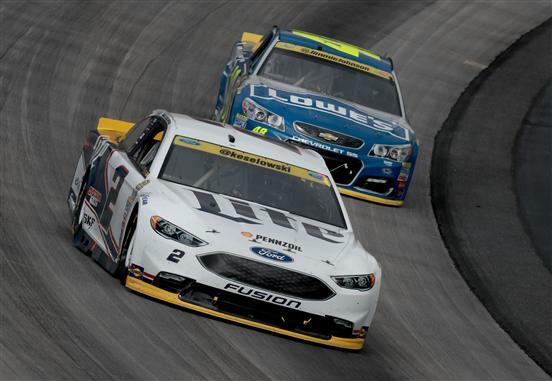 But Keselowski finished fourth and Logano sixth as the Team Penske drivers advanced comfortably into the Round of 12 of the Chase for the NASCAR Sprint Cup. And now that all drivers start the round with 3,000 points after a reset, Keselowski and Logano are back on equal footing. “Overall, we did what we had to do,” Logano said. “The points are back to zero, and we can head to the next round and try to get a win. Every track is different. Dover is obviously a beast of its own. It’s a very cool race track, but everything is so different compared to where we’re going to go next week to Charlotte and then Kansas and Talladega. Last year, after the first points reset, Logano swept the three races in the Round of 12. “It’s nice to have the reset,” he said. “We weren’t bad off in points at all, but to have the reset – we didn’t have the bonus points going into this round, so it’s nice to be at zero with everyone and be able to try to get ourselves a win and get through or have some nice, solid days like we had today to give us some kind of cushion by the time we get to Talladega.